Most of the time saxontheweb is annoying, but sometimes a gem comes out. 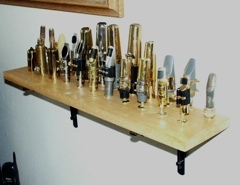 And here is one such gem….a mouthpiece rack. Wood, brass door stoppers with the tops cut off. Genius. Good job! While nothing really new (people have been doing this since the 70s), it’s good to see it still happening.